Last night, Richard and I went to see Standing at the Sky’s Edge at The Crucible Theatre, and then took part in St Wilfrid’s Sleep Out to raise money for the Centre – we didn’t plan to do both in one night, it just worked out that way. Richard Hawley and Chris Bush have created a musical about the history of Parkhill to be performed in The Crucible. Two iconic Sheffield buildings, built at around the same time. I am part of the half of the city who love Parkhill. I read that there is a half who don’t – although I have never met anyone who feels this way. Perhaps the people who felt trapped in the flats as the building and the community fell apart aren’t so keen on it. Like the other recent Sheffield musical Everybody’s talking about Jamie the timing of this could not have been better. The scene at the end of the first act brought me to tears. Proper gut-wrenching tears for the chaos and fear of our current situation, elicited by the music and cacophony depicting Parkhill, the symbol of post-war hope degenerating into the dangerously fragmented building and community it became. Richard Hawley’s songs are wonderful, evocative and lyrical, completely absorbing. The music, lyrics, writing, actors, musicians and sets were all world class; what was achieved in those 3 hours, without CGI or any other such effects was truly incredible. And no time to bask in it. A brisk walk to the car. I changed into warm clothes as Rich drove, and we arrived at St Wilfrid’s. I felt shy walking in, we were late – the other sleepers had spent the evening together with live music, soup and board games. But there was no need, Madeleine and Tracey spotted us and came straight over to thank us for coming. Before we knew it, it was 11pm – kicking out time. We had to find our spot in the car park, get some cardboard (it really does make a difference, we use it to stand on at winter events), and bed down for the night. There were 30 of us altogether, and Madeleine and Tracey kept watch around a log fire. The car park was locked, it is right next to the busy Queens Road, busy all night I now know. It was a cold and uncomfortable night, and long. We knew there was tea and bacon sandwiches at 6am, and so my first observation is how people who sleep rough must spend a lot of time waiting. Waiting for the centre to open, waiting for the sun to come up, waiting for the rain to stop, waiting for the hours to pass. And feeling cold and achey. Several times during the night I fleetingly thought that I might just have to go home – but as this would not be in the spirit of the thing, I stayed. I was also grateful for Richard sleeping next to me, I could roll into him for a bit of extra warmth, and also share the decision making. (We shared our bacon sandwich too, but soon decided that we should share a second one). As usual, the people of St Wilfrid’s make that place what it is, it is full of respect and kindness and love. Kevin Bradley first took us around about 7 years ago and told us that he believed that the difference between us and people who find themselves without a home is twofold; quality of mental health, and people around who will pick you up when times get tough. His vision to provide a place for the vulnerable and socially excluded is still very much alive. 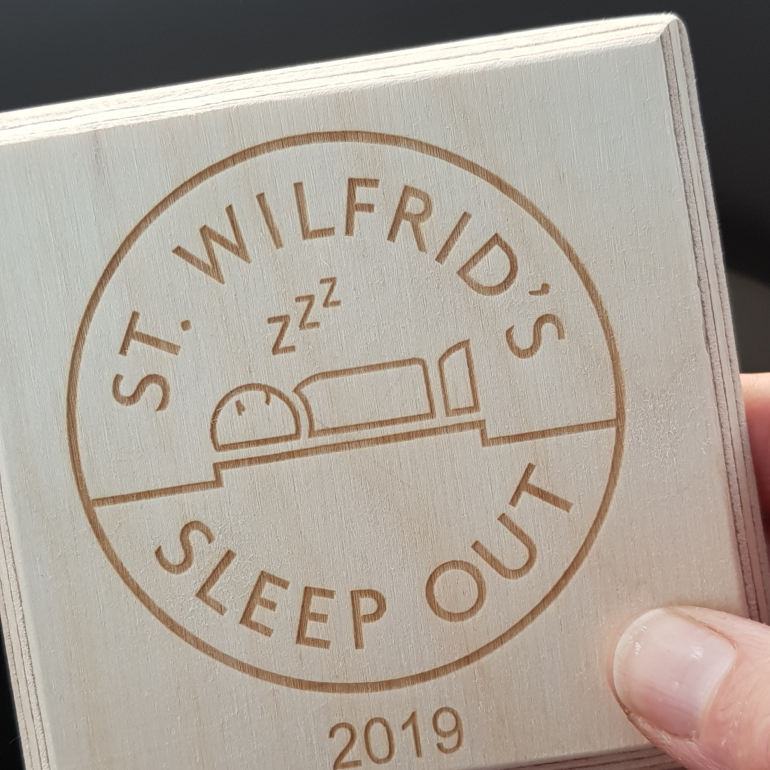 We were given a gift to say thank you for our tiny contribution, a coaster made in their sign shop by the clients of St Wilfrid’s. Thank YOU too if you have sponsored us. And I was so grateful for my home when I got back at 7 this morning. It looked like a picture-perfect family home (and those of you who know us, will know how UNpicture-perfect our house is), the birds singing, some blossom on the wonky plum tree, and it was WARM inside. I slept a little and have mainly been feeling a bit bonkers all day, I couldn’t have managed to make anything other than the most simple decisions. To misquote Connie in Standing at the Sky’s Edge “A home is just a series of boxes that hopefully keeps the rain out. It’s what you put in them that counts”. She was talking of the families that moved on from Parkhill, that they were OK, they had moved on and found new places to put their things. I thought of this quote as I lay in the car park very cold and thinking of my warm bed and my home, my own series of boxes filled with years of stuff and my favourite people – how lucky am I.
Secondly, I had to admit to myself that at times I struggle with the current political situation. I scoffed inwardly at someone talking on the radio about how it was making them feel anxious and having a significant impact on their day to day life. However, my experience last night has enabled me to recognise that I too am struggling. I have close friends and family who feel differently to one another. Who feel very strongly about what is happening in the UK one way or another. Some friends who marched for another referendum, and others who feel it would be catastrophic to our concept of democracy to have another referendum. I struggle with the language, the binariness of it all. We are not remainers or leavers, we are people who voted to remain or voted to leave. At times I am more fearful of what is happening to our sense of community than what will happen to us a country if we leave or remain in the EU. And amidst all of this, I feel utter despair that there seems to be no-one in government who can either lead us out of this mess, or who is able to negotiate or even has the will to agree with anyone else. Richard Hawley’s songs and Chris Bush’s story somehow allowed me to grieve for our current situation through the stories of the inhabitants of Parkhill Flats. I think it is a very very important piece of art. And thank goodness there are people here in Sheffield who are prepared to put it all out there and provide a spark that with careful love and attention can grow into something. Last night, I didn’t feel anger or fear or confusion or even (my personal favourite) immobilised. I felt sad, compassionate, inspired and even hopeful. I remembered I believe human nature is essentially good, and pretty resilient. And I remember my other belief that there is power in action, and if we focus our actions – however small – on our own families and communities, perhaps our circle of influence will grow to include Sheffield and beyond. So, that’s it. Thank goodness we have art and kindness. Art so we can work out how we might feel about something and be given the tools to express ourselves, or simply the space to feel it. And kindness to help others where necessary, to use our compassion for others when times are tough. All this on a night out in Sheffield!